GIGABYTE are very excited to offer any customers who purchase one of our brand new AORUS series motherboards (Z270X-GAMING 9, Z270X-GAMING 8, Z270X-GAMING 5, Z270X-GAMING 7 and Z270X-GAMING K5) FREE STEAM vouchers (while stock lasts). €20 with the Z270X-GAMING 7, Z270X-GAMING 5 or Z270X-GAMING K5. All customers need to do is buy the board and register with GIGABYTE at http://gaming.gigabyte.eu/2017Q1steam/. Once the registration is approved GIGABYTE will send you your voucher, so don’t miss out! For added benefit, registrants can receive an additional one year of warranty. * This Promotion is only open to residents of Austria, Belgium, Bulgaria, Czech Republic, Denmark, Finland, France, Germany, Greece, Italy, Luxembourg, Netherlands, Norway, Poland, Romania, Slovakia, Spain, Sweden, Switzerland, United Kingdom, Portugal, Serbia, Hungary, Latvia, Lithuanian, Estonia, Iceland, Ireland, Croatia, Slovenia. 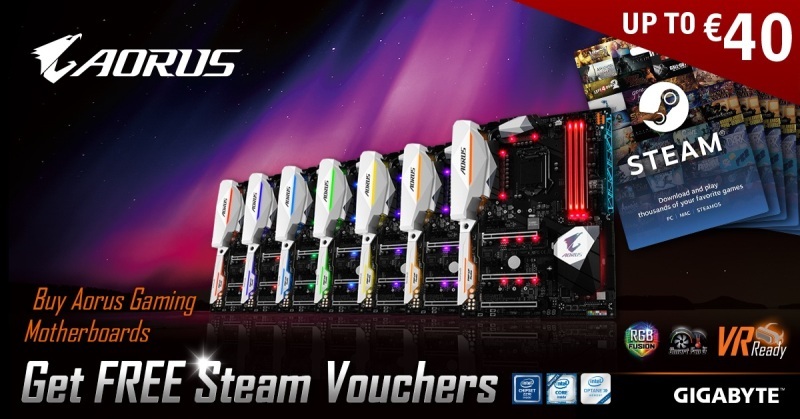 Re: Buy AORUS Gaming Motherboards and get FREE Steam vouchers! Is this going to be expanded to the AMD motherboards as well? It would be particularly nice, given the wait we had to actually get them!